On Tuesday 26th September from 6pm-7pm LASC and the Mexico-Ireland Solidarity Collective will hold a vigil at the Mexican embassy to remember and to call for justice for the 43 students and the thousands more like them who have been disappeared in Mexico. There will be a short ceremony including a roll call for the 43 and the symbolic laying of flowers. Please dress in black if you can. 26 September will mark three years since 43 teaching students were forcibly disappeared and six killed as they made their way to a protest in Guerrero, Mexico. Since then, investigations have indicated state involvement at almost every level but those responsible have not been brought to justice for these crimes. In fact, it has been shown that the Mexican Government have repeatedly lied to the international community about what happened that night in Iguala and has been openly hostile to the independent international commissions who have looked into the case. 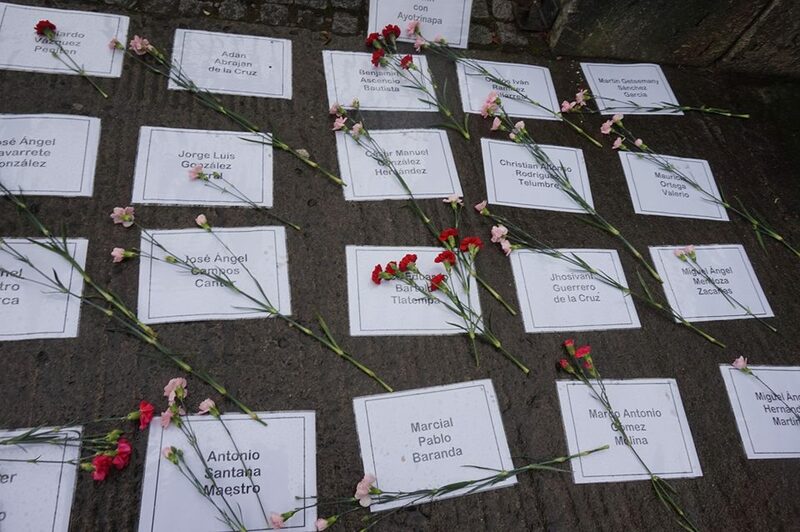 Despite repeated calls for action from the UN and the IACHR, the families still do not know the wherabouts of their loved ones. Following the most recent visit of the Inter-American Commissions ‘Special Follow-Up Mechanism to the Ayotzinapa Case’ in August this year, officials re-iterated the need for action on the part of the Mexican government to locate the missing students and to hold those responsible for this heinous crime to account. What is worse is that the 43 students of Ayotzinapa represent only the tip of the iceberg in a country whose official statistics register 29,917 disappeared people. This statistic is appalling in itself, and Jesús Peña of the UN Office of the High Commissioner for Human Rights in Mexico recently warned that disappearances in Mexico have reached frightening dimensions. In 2016 there was a marked increase in disappearances registered and 3,803 (over 10 a day) were reported last year alone. Yet NGOs worry that this statistic represents only a fraction of the true number of disappeared. They say fear of authorities has lead to significant under-reporting of the problem, and that the profile of people who disappear (young, vulnerable, marginalised, often migrant populations) means that sometimes their disappearance even goes unnoticed. Join us in our call for justice for the 43 and thousands more.